DailyHomeGuide may sounds helpful, however, it is identified as potentially unwanted program, which gives complex results once it established onto your system. A questionable toolbar named DailyHomeGuide was developed by Mindspark. It works well within most known web browsers such as Internet Explorer, Firefox, Chrome, and Edge. DailyHomeGuide is advertised as tool that allows users to find do it yourself home improvement and advice and more all from one convenient place. But, due to its unusual behaviors, DailyHomeGuide toolbar is flagged as potentially unwanted program by security experts. This toolbar can be downloaded from its own web site, yet in most cases, users obtained it through free downloads. Fraudster sees it as the fastest and easiest way to widely spread DailyHomeGuide. It tricks users to download and install extra toolbar while installing their chosen program. Right after gaining access on the PC by breaching user�s consent, it alters the browser�s settings. You may bump into web sites which you have no intention to visit. Indeed, DailyHomeGuide may gives you too much trouble while browsing online due to unwanted redirect. Also, scheming search results provided by this vicious program may lead you to malicious web pages. DailyHomeGuide possess privacy-invasive tracking tools. It allows violating the user�s privacy by tracking their search and online history. These gathered data is initially use for advertising campaign. It is being utilized to generate more profit for its author. But in worst case, this could even lead to more serious issue like identity theft. DailyHomeGuide is nearly having the same traits with EasyHomeDecorating, MyTransitPlanner, and ConvertDocsNow. They do have the same manner on how it deployed on the system. They do have also the same objective and effect on bugged machine. Large number of potentially unwanted programs which include DailyHomeGuide may be easy to acquire yet, this can be avoided. You just have to pay close attention when installing free software. As mentioned, this kind of programs are often obtained through free downloads. To remove DailyHomeGuide, download MalwarFox Anti-Malware. This tool is effective in getting rid of Trojans, viruses and malware. 1. In troubleshooting a PC, one common step is to boot operating system into Safe Mode with Networking. The same approach will be used in the removal of DailyHomeGuide. Please execute instructions based on your Windows OS version. To make sure that no more malicious files linked to DailyHomeGuide are inside the computer, we must run another effective scanner. This time, use Junkware Removal Tool. No installation is necessary with this tool. 6. After scanning the computer, JRT will open a Notepad containing scan logs. It may have not find DailyHomeGuide relevant entities, but it will surely delete any malicious items not found in the previous scans. 4. At the bottom of the page, click on Reset settings to remove all changes made by DailyHomeGuide. 4. In order to reverse modifications caused by DailyHomeGuide, click on Reset button to bring back Internet Explorer's settings to their default condition. 3. Click on Refresh Firefox button to erase the effect of DailyHomeGuide. 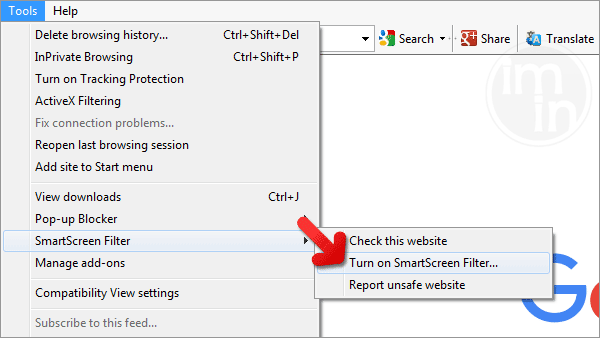 SmartScreen filter is a built-in feature in Microsoft Edge browser that can help you deter malicious programs such as DailyHomeGuide. It can block malicious web sites and downloads.